Download the FREE 96.1 BBB app and never be without your favorite radio station! Listen at work, at home or on vacation! Use the app to get instant access to your favorite music, connect with 96.1 BBB on Facebook, or send us photos/videos/audio. 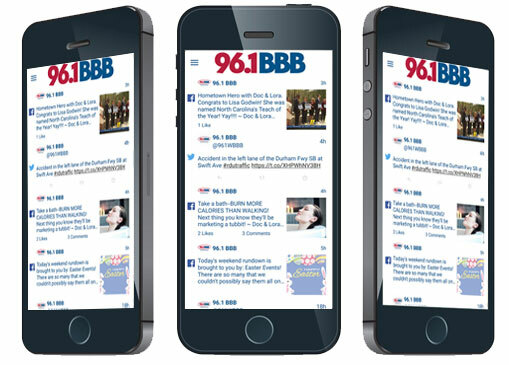 What can you do with the 96.1 BBB App? Listen to 96.1 BBB wherever you go! Have an Alexa Smart Speaker? Just say “Alexa, play 961 WBBB” to listen to 96.1 BBB via the TuneIn skill.